Turkey’s 3U CubeSat UBAKUSAT carrying an amateur radio 145/435 MHz SSB/CW transponder is planned to be deployed from the ISS in 2017. The linear transponder is almost the same as that on the TURKSAT-3USAT which was launched on April 26, 2013. The satellite is being developed by Istanbul Technical University, Faculty of Aeronautics and Astronautics, Space Systems Design and Test Lab (SSDTL) along with TAMSAT, GUMUSH and ERTEK Ltd, with some support of the RF lab of ITU (RFL) and Ministry of Transportation, Communication and Maritime in collaboration with the Japanese Government. 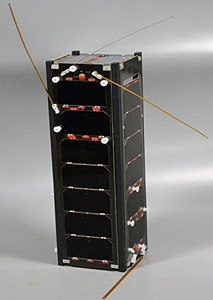 The first ever CubeSat of Turkey, ITUpSAT1 was also successfully developed by SSDTL. ITUpSAT1 was placed in a LEO orbit of 720 km, on September 23, 2009 by a PSLV rocket. Its beacon signals are still heard by amateur radio stations worldwide. The primary mission of UBAKUSAT is to provide voice communications for amateur radio stations around the globe. Additionally the satellite will carry the TAMSAT Simplesat card which will send telemetry data, including the relative radiation data absorbed by the card, to ground stations. There is also a CW beacon. The satellite also contains typical subsystems that are required for its successful operation: structure, EPS, batteries, solar panels, OBC, antenna. The estimated duration of the satellite mission is about 6 to 12 months before re-entry. The launch from Japan to the International Space Station is planned for late 2016 or early 2017 and deployment from the ISS will occur sometime later.